Once again I have the pleasure of reviewing a book produced in South Africa. In the latest team effort, the authors have continued their practice of combining aircraft, armour and regalia sections in a single volume. They have, however, changed their printing process, in that entire book is now produced digitally. This latter change was undertaken to accommodate the small number of books produced, which became prohibitively expensive using conventional printing approaches. This change has, however, not affected the quality in any manner. Indeed, if anything, the illustrations appear sharper and better defined than in previous volumes. The authors also point out that this change will facilitate the future printing of volumes devoted to a single type. As such, this volume is the last of the series dealing with a number of topics. The coverage of the JU 52 and Ju 86 is very welcome, as previous documentation on these aircraft in SAAF service has been extremely limited. 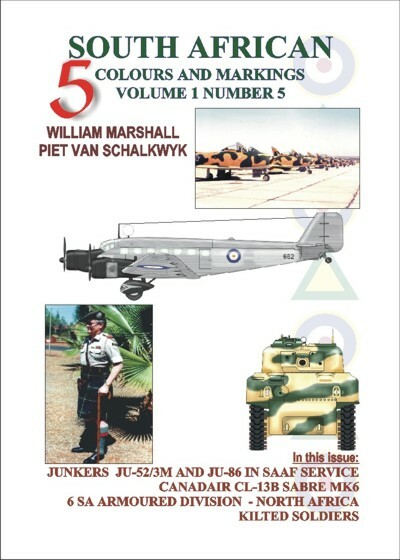 The section on the JU 52 covers the acquisition 15 aircraft by the South African Airways in the period of 1934 to 1938, the various schemes used by this carrier and the official names bestowed on these aircraft e.g. ZS-AFA �Jan van Riebeeck�. Of particular interest are the details of the Pratt and Whitney �Wasp� engined aircraft, those powered by the more powerful Pratt and Whitney �Hornet� engines, in that the wing-mounted engines in the former case display the characteristic outward splay, whereas on the latter aircraft, the engines are mounted parallel to the fuselage. This would surely, not the easiest conversion to undertake! The use of these aircraft by the SAAF is well covered, and details are provided of the various schemes e.g. initial overall aluminium scheme and final dark green and sky blue scheme. 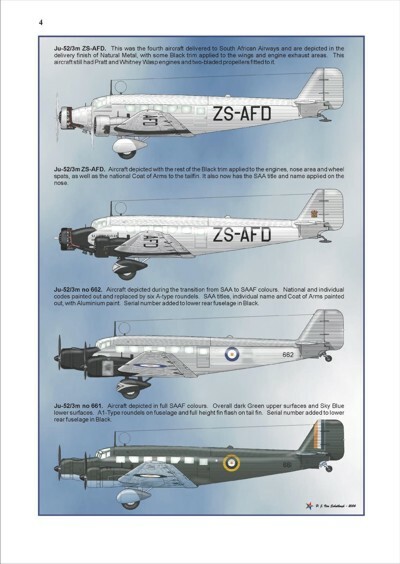 An added bonus is the inclusion of the 12 captured JU 52�s in service with the SAAF. These facets are covered by numerous photos, many of which the reviewer has not seen before, as well as excellent profiles (side, bottom and top). What more could a modeller ask for? The JU 86 must rank as one of the most aesthetically pleasing aircraft of its period. Unbeknown to many, SAA acquired 18 of these aircraft, making it the largest civilian operator of the type. Of particular interest is that one of these aircraft operated by SAA was a Ju 86K-1 bomber, complete with �dustbin turret� and bomb racks. The operation of such a type by a peace time civilian operator gives an inclination of the dark clouds looming on the horizon. The use of these aircraft in their maritime patrol role, as well as their activities as bombers in the Abyssinian campaign in East Africa in 1941 are well described and supported by copious photos and 3 view profiles. The next section of this book again typically deals with a more modern aspect of SAAF history, in this case the Canadair CL-13B Sabre Mk6. These Sabres, powered by the powerful /275 lb thrust Orenda jet engine, and having the rather unique combination of the wider �6-3� wing with leading edge slats, were reported to be the most agile of all Sabre variants. The service of these aircraft, from their acquisition in 1956 to their retirement in 1980 is well documented. Numerous schemes are covered, including the livery scheme with commonwealth Springbok roundels similar to that used in Korea, the change to the 5 pointed �castle� roundel in 1957, the special markings used by No.1 and 2 Squadrons, including a striking day-glo orange variant, to the final camouflage schemes as used by 1 Squadron (prior to their transition to the Mirage F1AZ) and the final days with 85 Advanced Flying School. This section is rounded off by a very nice walk-around of two surviving Sabres in South Africa. As such, this section will be a great help to those wanting to model any one of these aircraft, and will excellently complement the Leading Edge decal set for these SAAF Sabres. Having gained an increasing interest in armour, thanks to the release of Tamiya�s excellent 1/48 kits, I was particularly pleased to see the section on 6 SA Armoured Division in North Africa, as one of the vehicles described is the Sherman. Particularly useful is the description of the camouflage scheme used, the types of pennants used for identification, as well as details of several personalised, such as �Rose�, �Periwinkle� or �Umzintzanti�. These aids will surely help this, and other, devout aircraft modeller(s) to find more enjoyment in building a few �targets�. 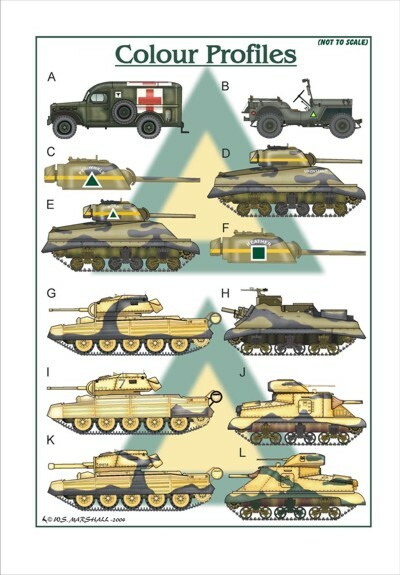 This discourse also provides a useful indication of the number of different types of tanks used by the SADF in North Africa, which included Sherman, Crusader, Grant, Priest and Stuart. The final section on uniforms and regalia deals with Scottish regiments in South Africa, tracing their routes back to the Anglo-Zulu war in Natal in the 1800�s. Details are provided of the Transvaal Scottish, the Cape Town Highlanders and the Witwatersrand Rifles. All in all, this is a superb volume and should please any SAAF/SADF devotee. As such, we can look forward to future volumes which will cover the Spitfire in SAAF service during WW2, the early years of the Mirage III, as well as the 6 SA Armoured Division in Italy. As pointed out above, all of these will be now be dealt with in single discrete volumes. Copies of this limited edition print are available directly from the authors at: mechinf@netactive.co.za.